Billy Roche’s slugging drama “Lay Me Down Softly” invites the audience not into a theatre in the traditional sense but into the burlesque world of the travelling fairground and rather dank Academy Boxing Arena of Delaney’s Travelling Road Show. Set in 1960’s Ireland and parked somewhere along an unnamed stretch of a rural Irish town, Roche creates a world of has-bean boxers, fair-ground bosses, cut-men and fixers – a group of men and women toughened by their past lives and cemented by their transient lives on the road in Ireland. Theo, played by Gary Lydon, is the head of this wandering family, and rules it with quite some vigour. He treats this world as a business and seems to care little personally for his fighters and staff unless it affects their potential to perform in the boxing ring. Business is good for Theo until a pro-boxer, a bookie and a marksman that “must be in the FCA” threaten the welfare of the fair at this particular juncture. The unexpected arrival of his sixteen year old daughter, Emer,(Pagan McGrath) adds no extra stability to the already wavering applecart that is Delaney’s Travelling Boxing Academy. This is a self-regulated society that Theo is judge and jury, A dishonest stall-hand, Rusty, find this out the hard way and signals that punishment by Theo is tolerated. “Let the word go forth”. 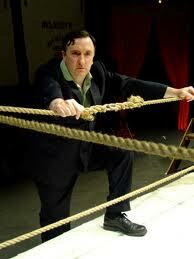 Peadar (Michael O’Hagan) is his aged but warm cut-man who has spent his life in sweat and blood filled gyms. Theo’s Gangster’s Moll, Lily, played by Simone Kirby, adds to the dynamic of relationships VS brotherhood VS sexuality that runs throughout Roche’s play. The journey-man Dean (Anthony Morris) and the ‘next-big-thing’, Junior,(Dermot Murphy) are the more like machines to Theo than people. They must be maintained and nourished, more profitable to him than Lily or his ex-wife Joy could be. The travelling lifestyle of Theo and his crew seems to just about sustain them rather than let them live. Theo’s past wife and mother of Emer left life on the road and now Lily is desperately seeking to escape the small-town monotony that comprised her past life. These characters seem to always be escaping something, be it boredom, ex-loves, injuries or past lives.They are running and running and seldom stopping to truly consider where they are or what they are looking for. Emer asks Peadar at one stage “How can you tell where in the world you are from one day to the next?” with Peadar’s considered answer being “I’m good and lost wherever I am”. All their journeys did not start together but have intersected on the road and are stuck with each other, for better or for worse. The insistence of memory and cast of characters that exist solely through recollections reminds me of another classic play of the memory form – Brian Friel’s “Faith Healer”. The travelling and wandering Frank Hardy has many similarities with Theo who, along with his crew, isolate themselves in a transient lifestyle with few trusted friends and even less stable relationships, where most is learned about the present state of the characters through solemn rendition of their memories. The Wexford accents of the cast add to Roche’s ability to really write for the ear. He writes the local and makes it national. He creates this male dominated world of the boxing ring, full of “sweat and dust and blood” and allows it to be totally disarmed and any masculine facades broken down by the women in this play. While the men struggle to keep up the act of being tough enough or strong enough, basically being gladiators in the arena, they are completely inept in maintaining a lasting relationship. Emer’s attempts to convince Junior to ditch this life, not the life on the road, but just the life in the ring, is incredibly touching and poignant. While some in this crew lean on the ‘security’ of a life on the road and in the ring like a crutch, it is possible to escape. The real strength is realising when to get out and being willing to take any blow or punch to make this happen.